Bay Area experimental film distributor Canyon Cinema once printed an eclectic, photocopied newsletter that was described by the Stanford Archives as “the main organ of the independent filmmaking community.” Abandoned due to lack of resources, the demise of the Canyon Cinema News left a hole in the Bay Area experimental film and art scene. The purpose of this zine is to reignite the discussion of underground and independent film/video practice and theory, putting artists in the Bay Area in dialogue with the greater experimental community. 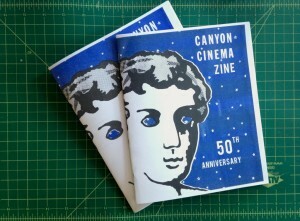 This zine was christened the “Canyon Cinemazine,” hoping it would carry on the experimental and community-oriented tradition of the Cinema News. Drawing inspiration from mail art and ephemeral media, the Canyon Cinemazine harkens back to the days of typewriter correspondences between avant-garde artists in the 1960s. Thanks also to San Francisco arts non-profit Southern Exposure for their generous Alternative Exposure grant. To purchase copies, or for more information, please visit the Canyon Cinemazine website. A series of rephotographed sound sources.